The other day Oliver and his friend sat at our dining room table with a big stack of white paper, a huge assortment of felts, and tons of ideas. As always happens when kids put their creativity to work, they had some really beautiful pieces to show off. As it happened, they both had winter on their minds. 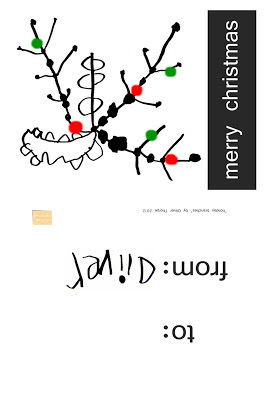 Their creations then in turn inspired me: I ended up scanning parts of their doodles to create a very unique and personal set of Christmas cards for them to hand out to their friends at school! by the time he was done. 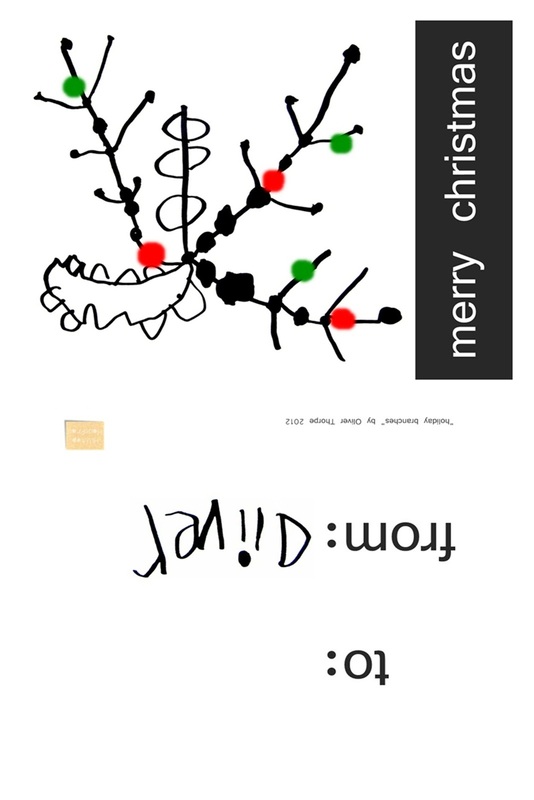 I scanned his branches, adding a Christmas messsage. It was simple to create a print - and - fold template. To help Oliver out, I scanned his printed name in too. He'll have lots of work printing in his friend's names! The fold-and-sew cards make perfect pockets to tuck a sweet treat into! A pretty stack ready to deliver! Really, I'm so pleased that I am able to continue the annual tradition of homemade cards for our Oliver. He is so proud of his makings and is learing about accountability and giving all at the same time! What a wonderful and personal card! These are so great! What a lovely way to personalize the holidays! They are wonderful!! The friends had fun and made something useful, what a great feeling for them. TFS! I love this, specially the snowflake! Somewhere I saw a mother turn her son's old drawings into a black & white linear pattern for bed sheets. I thought it was a pretty cool idea. Just so cute! Kids make such fun art! Such a lovely idea! It is a great way not only to preserve kids art but to give it as stylish modern gifts. What an inspiration you are! These are adorable! I love this idea. Thanks for the feedback, as always! Ollie is getting excited to hand out his little MOMA samples!